Cardassian Personnel of Cardassian species. "I didn't ask you about Minos Korva. I asked how many lights you see. ...I don't understand how you can be so mistaken." 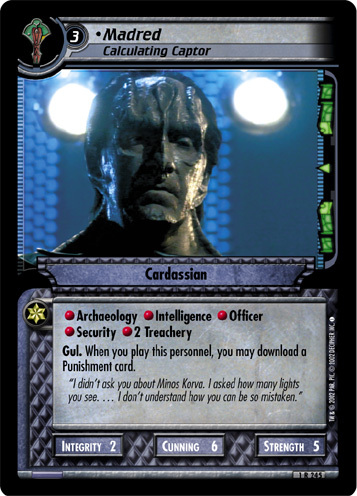 Characteristics: affiliation, download, download - Punishment (cards), Gul, personnel who has a cost of 3 or more, Cardassian species. There are 18 entries for Madred, Calculating Captor (ST2E 1 R 245) at the Tradeplace (14 haves and 8 wants). Click here to see all trade list entries for this Rare card!